No matter how you describe it, protecting and safeguarding vulnerable people (PVP) is a job for collaboration. Multi-agency working is what works, and we have made it simple for partners to work better together in the pam secure cloud platform. If you are aiming to improve the way you track and manage referrals amongst partners, whether as part of a MASH (typically co-located hub) or as a remote multi-agency collaboration, pam can help you get the work done. To enable longer term demand reduction and more innovative approaches to change, pam also facilitates more of your PVP and safeguarding work to get it done from one place. 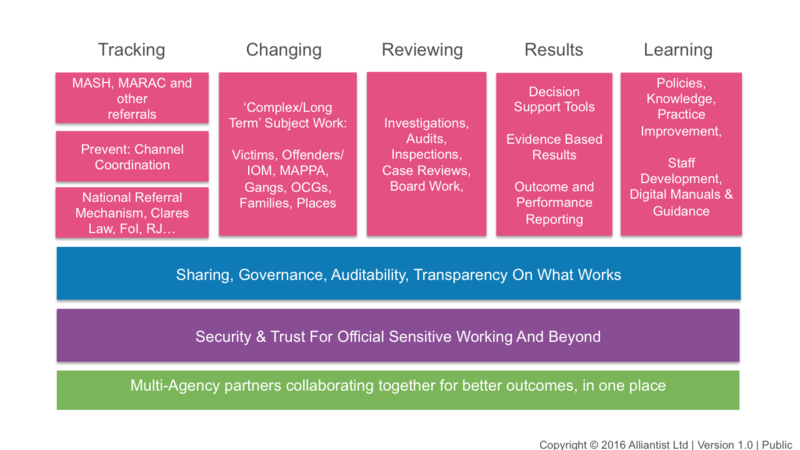 The image highlights examples of multi-agency PVP type responsibilities that can be connected together for a more effective whole to deliver benefits for the service users, and organisations at lower cost and risk in faster time than alternatives. Depending on priorities, appetite for change and budget, customers can start with one aspect of the solution or adopt the whole package. It is quickly and easily procured over the GCloud. We can also facilitate integration of local agency IT systems with pam to help avoid duplication of work. Constant repetition amongst agency partners is of course a bigger problem and you can read about that and our top 10 tips for safeguarding success here too.